Category: Ika(squid). Season: year round, with different varieties in season at different times. The famed Aori Ika is in season in the summer. It is believed that there are over four hundred types of ika throughout the world's oceans, with over one hundred species found in Japan's waters alone. 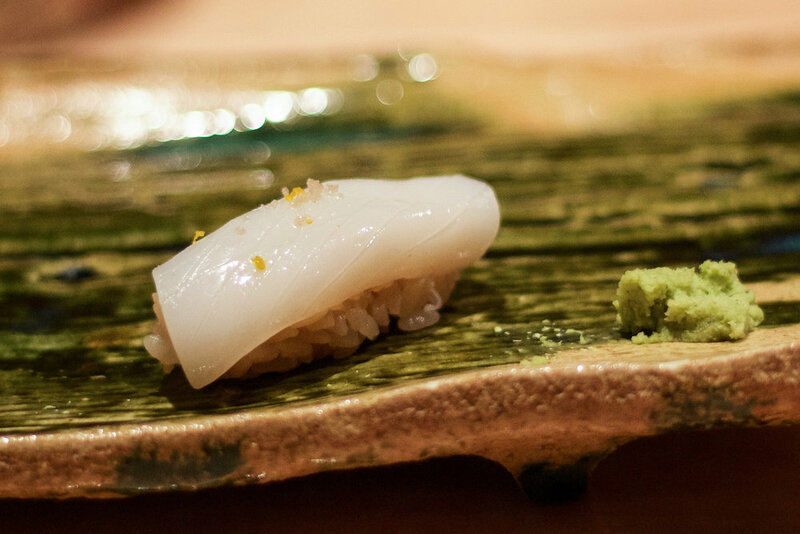 Out of all of these sub-species, many sushi chefs find Aori Ika to be the most delicious. Sadly, it is a rather rare species, so sells at a premium. Squid weighing between 2 to 4.5 pounds are best for sushi. Because of the thickness of the skin, a good sushi chef will thinly and decoratively slice the ika, as pictured below. Good ika has a wonderful sweetness that increases as the piece is chewed, and a fresh ocean aroma. It is usually served with sudachi and a sprinkle of salt.